IIOPR Pedavegi Recruitment 2018 2019 Application Form for 02 Accounts Assistant, Young Professional Posts Download Application through Official website www.dopr.gov.in. IIOPR Pedavegi Accounts Assistant Jobs Notification 2018 Released. 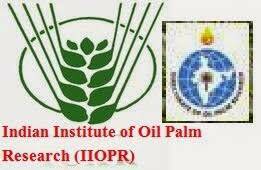 IIOPR Pedavegi invites Walk in Interview for appointment in following Accounts Assistant post in Indian Institute of Oil Palm Research. Candidates are requested to Download Application through Official website www.dopr.gov.in. Prospective candidates will have to before Walk in Interview carefully reading the advertisement regarding the process of examinations and interview, eligibility criteria, Offline registration processes, payment of prescribed application fee/intimation charges, IIOPR Pedavegi pattern of examination, IIOPR Pedavegi Syllabus, IIOPR Pedavegi Question Paper, IIOPR Pedavegi Walk in Date, IIOPR Pedavegi Result Date etc. 1. Accounts Assistant (contractual) - Essential: Bachelor of Commerce (B.Com) degree from recognized university or college Desirable: M.Com/MBA(Finance) and knowledge of office automation software like MSOffice, Tally etc. 2. Young Professional - I - Essential: B.Tech. in Computer Science/IT, B.E. (ECE)/Graduate in Engineering. Desirable: Knowledge of database management system, Management Information System/Financial Management System and good communication skills. Work experience with use of ERP system (in HR/Finance/Purchase domain) in public or private organizations will be given preference. Interested and eligible candidates may attend Walk-in-Interview at ICAR-Indian Institute of Oil Palm Research, Pedavegi, West Godavari District on 20.03.2018, at 9.30 A.M. along with their biodata (furnishing name, permanent address, photograph affixed, date of birth, qualification and experience) and attested copies of certificates. Original certificates should be produced at the time of interview.